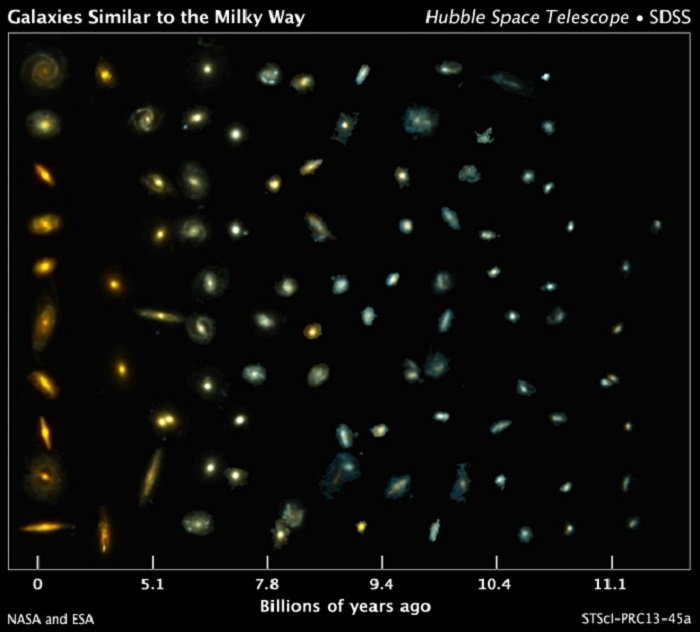 This composite image shows examples of galaxies similar to our Milky Way at various stages of construction over a time span of 11 billion years. The galaxies are arranged according to time. Those on the left reside nearby; those at far right existed when the cosmos was about 2 billion years old. The bluish glow from young stars dominates the color of the galaxies on the right. The galaxies at left are redder from the glow of older stellar populations. Astronomers found the distant galaxies in two Hubble Space Telescope surveys: 3D-HST and the Cosmic Assembly Near-infrared Deep Extragalactic Legacy Survey, or CANDELS. The observations were made in visible and near-infrared light by Hubble's Wide Field Camera 3 and Advanced Camera for Surveys. The nearby galaxies were taken from the Sloan Digital Sky Survey. This image traces Milky Way-like galaxies over most of cosmic history, revealing how they evolve over time. Hubble's sharp vision resolved the galaxies' shapes, showing that their bulges and disks grew simultaneously. Hubble Sees a Stellar "Sneezing Fit"
Look at the bright star in the middle of this image. It appears as if it just sneezed. This sight will only last for a few thousand years — a blink of an eye in the young star's life. If you could carry on watching for a few years you would realize it's not just one sneeze, but a sneezing fit. This young star is firing off rapid releases of super-hot, super-fast gas, like multiple sneezes, before it finally exhausts itself. These bursts of gas have shaped the turbulent surroundings, creating structures known as Herbig-Haro objects. These objects are formed from the star's energetic "sneezes." Launched due to magnetic fields around the forming star, these energetic releases can contain as much mass as our home planet, and cannon into nearby clouds of gas at hundreds of kilometers/miles per second. Shock waves form, such as the U-shape below this star. Unlike most other astronomical phenomena, as the waves crash outwards, they can be seen moving across human timescales of years. Soon, this star will stop sneezing, and mature to become a star like our sun. This region is actually home to several interesting objects. 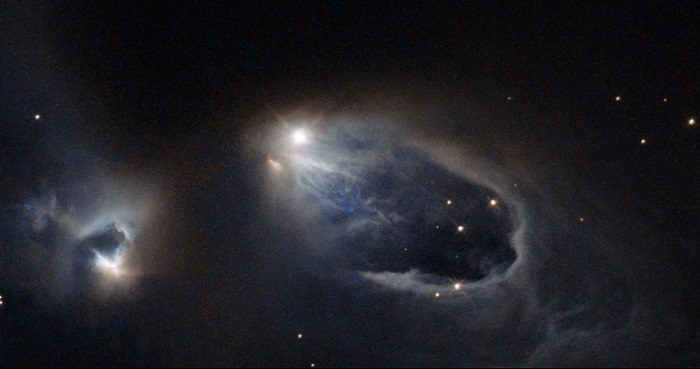 The star at the center of the frame is a variable star named V633 Cassiopeiae, with Herbig-Haro objects HH 161 and HH 164 forming parts of the horseshoe-shaped loop emanating from it. The slightly shrouded star just to the left is known as V376 Cassiopeiae, another variable star that has succumbed to its neighbor's infectious sneezing fits; this star is also sneezing, creating yet another Herbig-Haro object — HH 162. Both stars are very young and are still surrounded by dusty material left over from their formation, which spans the gap between the two.